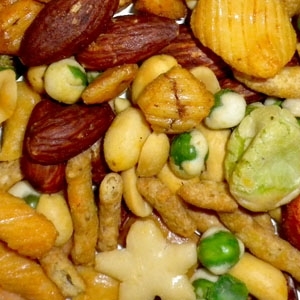 Wholesale Oriental Mix is a snack of Peas, Almonds, Peanuts and more. INGREDIENTS: PEANUTS (PEANUTS, OIL (PEANUT, SUNFLOWER, CANOLA, COTTONSEED), SALT), RICE CRACKERS (GLUTINOUS RICE, SUGAR, WHEAT STARCH, SESAME SEEDS, SEAWEED, CHILI POWDER, CARAMEL COLOR, YELLOW 5 & 6, SOY SAUCE (WATER, SOYBEAN, WHEAT, SALT), SESAME STICKS [UNBLEACHED WHEAT FLOUR, MALTED BARLEY FLOUR, SOYBEAN OIL, SESAME SEEDS, BULGUR WHEAT, SALT, BEET POWDER (COLOR), TUMERIC (COLOR)], WASABI PEAS (GREEN PEAS, GLUTINOUS RICE FLOUR, CORN STARCH, WASABI (MUSTARD POWDER), SUGAR, SALT, SOYBEAN OIL, YELLOW 5, BLUE 1), WASABI PEANUTS (CORN POWDER, PALM OIL, WASABI (MUSTARD POWDER), SUGAR, SALT, YELLOW 5, BLUE 1), ALMONDS, SUNFLOWER SEEDS, PUMPKIN SEEDS. ALLERGEN INFORMATION: CONTAINS PEANUTS, WHEAT, SOY, ALMONDS. CAUTION: MAY CONTAIN SHELL OR SHELL FRAGMENTS.